If you know what it means to have an organized life, then I must say that I am totally envious of you! I have spent the last few days of this new year scrambling and searching for a way to get my life in order. My daily activities seem to be one of the most scattered schedule anyone would get to know. Now, it is getting dawn on me that I need to start packing every piece together, fixing them accordingly as they should be played out each day. A normal day for an average religious person often start basically with prayers and chores but mine starts with a smartphone. I still try to figure out how I grew so engrossed with being online every bit of the day. Rarely have I had or achieved a properly planned day because I am stuck to a self-imposed unhealthy lifestyle. A lifestyle that have led me to having more unfinished businesses than finished businesses. Well, people learn and I think I have learned the importance of having and achieving a well planned out day, especially now that my hands are getting piled up with various activities which do not surpass each other. I wish to treat every bit of my daily activities as I would treat the other. I have a school project to battle with this year, a blog to maintain and above all a healthy life to grow. How would I ever get achieve this without being organized? Several people have tried to help as I have shared with different persons my cravings for an organized life. I have sought advised from people, I have read blog posts and in case you'd want to advise to download daily planners and schedulers, I'd love to let you know that I have had several planner apps on my device which all ended up being yet another useless application on my phone. Having allowed different people take a ride into my life, a few of them saw right through me and have suggested several solutions that could help me achieve an organized life. I am glad that I sought for help from some individuals because they have been of great help to me. My planner for 2mthe year 2018 is one few miles away from me now and I can't wait to give it a big WELCOME TO MY LIFE hug. Now that my life is about to finally get all that it had sought for in donkey years and I do hope that in years to come, January 2018 will be an unforgettable time in my life. The moment I finally worked towards achieving an organized life. Well, don't we all just wish for an organized life... It's pretty easy giving tips and advice. I know I could. 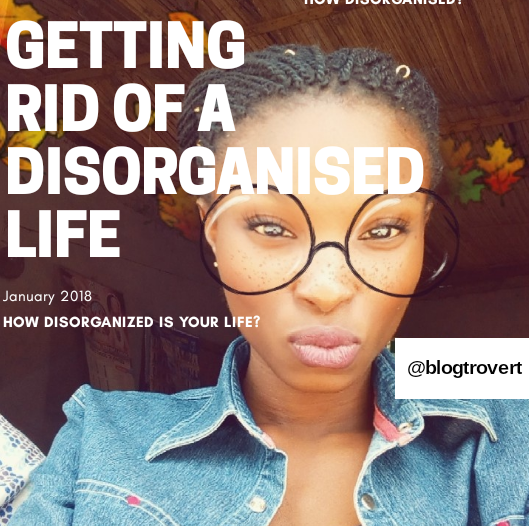 Well, I will like to let you know that you might get bored when you finally have that organised life you so crave right now. I'll suggest you have yourself all planned out but leave a little space for spontaneity...just a lil. I do not plan on being strict with myself, no never! I just need to be less unserious with life. I need to do things at the right and best time. I honestly do need an organized life right now. Thanks babe.